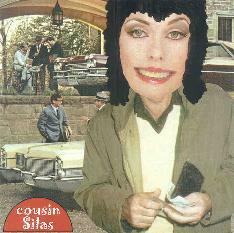 Cousin Silas - "Lilliput" / "Portraits & Peelings"
Cousin Silas is the electronic sound artist alter ego of Dave Hughes, editor of the outstanding zine, Modern Dance. Lilliput is an 18 minute collection of 7 brief tracks. The music consists of a variety of sound collage and avant-garde electronic pieces that can be abstract, spacey, aggressive... and all that and more at the same time. We get an interesting glom of avant-garde electronics and whimsical fun, dense electro aggression that paint sonic landscapes with a tank instead of a brush, and sound collage bits with cool looped effects. Among my favorites was the spacey proggy "Warlock Hill" and "Setting The Clinch", which is like a robot dance party in a tunnel with a bit of a Residents vibe. There's lots of interesting ideas on Lilliput, but music and sound works like these need a wee bit more time to be properly fleshed out. And well... what do you know? 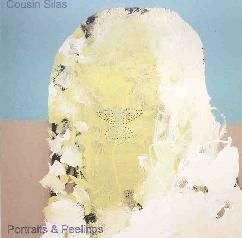 As if in answer to the call, the latest from Cousin Silas, entitled Portraits & Peelings", is a full length set of a dozen tracks that don't go on lengthy excursions but most of which do take the time needed for fuller development. And whereas Lilliput featured more experimental works, Portraits & Peelings offers much more to the lover of all things space, while still retaining enough of the avant-garde elements to keep things extra interesting throughout. The set opens with "Bug Lady", a cool combination of cosmic space and harsh sound waves. Real spaceship engine room stuff. Cousin Silas kicks in the thrusters and soars into deep space with "Olympus Mons", "Window Spinnerets" and "Glass Ravine", all of which take us into some of the darker regions of Tangerine Dreamy space, but also have a somewhat heavenly vibe. If there were howling winds beyond the Earth's atmosphere... this is what they would sound like. Eerie and image inducing. "Congealer" brings to mind a chat room for aliens. "Butter Of Death" and "Atonement With Beasts" are among the quieter, but by no means calmer tracks, focusing on atmosphere, texture and theme. "Hologram Chopper" occupies a freaked out corner of space that's brimming with radio signals, bleeps and blurps, and a banquet of strange sound patterns that all come together in perfect alien harmony. And "Out Of A Neutron Sea" features alien industrial engine room freakout sound-art. Overall, an impressive set of floating space with an adventurous experimental edge. Imagine early Tangerine Dream meets the Residents. For more information you can visit the Fflint Central Recordings web site at: http://www.fflintcentral.co.uk.